2.Why is Stakeholder Management Important? Stakeholder management is the process by which you organise, monitor and improve your relationships with your stakeholders. It involves systematically identifying stakeholder; analysing their needs and expectations; and planning and implementing various tasks to engage with them. A good stakeholder management process will be the means through which you are able to coordinate your interactions and asses the status and quality of your relationship with various stakeholders. Most definitions of stakeholder management tend to focus around the idea that you can "manage your stakeholders (in order to get them to do what you want)". The emphasis is placed on creating a stakeholder management plan that maps the level of interest and influence of stakeholders and list various levels of engagement for the different groups. A plan that is usually created at the start of the project and then filed away to gather dust. This guide takes a different focus. We're not going to show you how to herd sheep, put them in neat little pens and then pretend that they are all heading in the direction you want. In most cases there is a legal and a strategic objective to undertaking stakeholder engagement/consultation/management. You might have a statutory or legal requirement to consult. And you hopefully have a clear idea of the strategic benefits you might derive from doing it well. This guide will show you how you can achieve both those objectives. Why is Stakeholder Management Important? A vital part of running a successful project is to develop and maintain good relationships with those communities who will be affected and other stakeholders. Investing time in identifying and prioritising stakeholders and assessing their interests provides a strong basis from which to build your stakeholder engagement strategy. An in-depth understanding of your stakeholders supported by a sound engagement plan that is strategic, clear and prioritised help you develop and maintain relationships with those affected, mitigate risks, align business goals and eliminate delays. In these days of increasing legislation around protection of privacy and the right to information, it is even more critical that an organisation or project has a clearly defined Stakeholder Management plan and protocols in place. The risks of not taking a systematic, controlled approach to stakeholder management are high and increasing along with community expectations. Companies that have grasped the importance of actively developing and sustaining relationship with the affected communities and other stakeholders are reaping the benefits of improved risk management, increased stakeholder support, and better outcomes on the ground. Good stakeholder management also brings in ‘business intelligence’. Understanding stakeholder concerns and interests can lead to ideas for products or services that will address stakeholder needs; and allow the company to reduce costs and maximise value. Get a structured guide for getting started with Stakeholder Management by downloading The Essential Guide to Stakeholder Management here...its free! A Stakeholder Management Plan is a document that outlines appropriate management strategies to effectively engage stakeholders throughout the lifecycle of the project, based on the analysis of their needs, interests and potential impact on project success. Be strategic and clear about whom you are engaging with and why, before jumping in, not only helps save time and money, but also helps manage expectations and gain trust. What are the strategic reasons for consulting with stakeholders at this stage? What are the priority issues (for them and for you)? What will be the most effective methods of communicating with stakeholders? Who within the company is responsible for what activities? Are there any other engagement activities that will occur in the proposed timeframe (perhaps with other sections of your organisation)? Are there opportunities to collaborate to ensure key project messages are consistent and avoid consultation fatigue? How will the results be captured, tracked, reported and disseminated? The key to a successful stakeholder engagement or public consultation program is to start with a good understanding of your stakeholders. And make sure you are testing and refining that understanding throughout the process. What information do they want from you, how often, and in what format/channel? What financial/social/emotional interest do they have in the outcome of your work? Is it positive or negative? What are the key motivations that will drive their perceptions of your project or organisation and their interactions with you? What is their current opinion of your organisation and project? Is it based on good information? Who influences their opinions, and who they influence in turn? Trying to decide between a CRM (Customer Relation Management) product and a SRMS (Stakeholder Relationship Management System) can be tricky if you haven't been exposed to any of these types of software before. You may not be sure if you need a stakeholder database or what the difference is between the various consultation tools out there. Or perhaps you're wondering if you should stick to Excel as it's worked well for you in the past? How about all the fancy new products popping up all over the place, focusing on one type of consultation, be it mapping or online forums, where do they fit in? 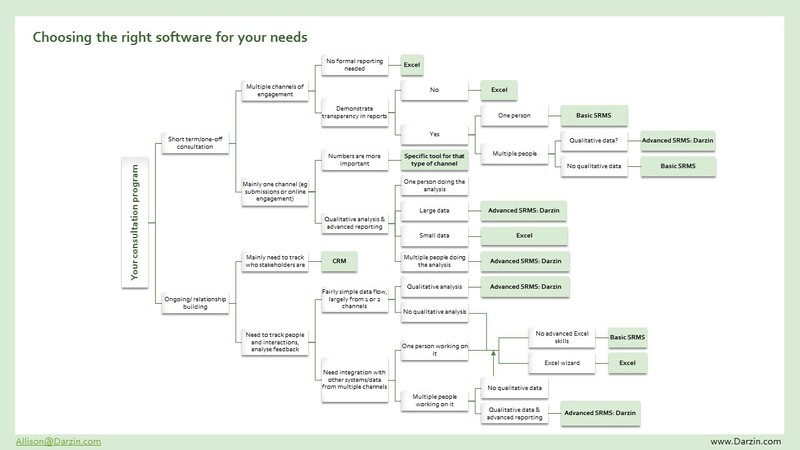 The flowchart below can help you navigate through some of the basic considerations in selecting the right tool for your needs. Download a copy of the flowchart here. CRMs are generally designed around a sales process, which is fundamentally quite different to an engagement process. If you want to manage your engagement and understand your stakeholder's needs, concerns and feedback, using a CRM is going to make things trickier, if not impossible. There is a big difference between customers and stakeholders! For a start, customers are people who receive or consume products and can choose between different products and organisations. Not people who are affected by, have an interest in, or the ability to influence a project – i.e. your stakeholders. The approach of how you engage and build stakeholder relationships will differ from the process of engaging with customers. As you can see the sales approach of tracking people through stages in a sales pipeline isn't the same as a stakeholder engagement process. CRM software was developed specifically to cater to the sales steps and is not adept at conforming to the management of your data. Stakeholder Relationship Management (SRM) software is designed specifically for community and stakeholder engagement. While both a CRM and SRM can track stakeholders and their contact details well, an SRM is also designed to track and analyse the purpose and content of the engagement with the stakeholders. A CRM is designed around tracking where a contact is in a sales pipeline. A SRM is designed around understand the engagement with the stakeholder - what they are saying to you, their needs, priorities and concerns. An SRM like Darzin gives you the organised, segmented, up-to-date list of your stakeholders, as well as the 'one source of truth' visibility of all of the interactions anyone from your team is having with your stakeholders. With an SRM you can log essential questions about the stakeholder engagement activities – Who’s been contacted about a particular issue? Where and when did consultation events take place? What were the results? But more importantly, you can commence with qualitative analysis and advanced reporting on your engagement activities. You’ll always have your finger on the pulse of your stakeholder relationships and engagement! The video below gives you a little insight into how Darzin handles some of the core tasks of Stakeholder Management. If you'd like to see more of Darzin or learn about our approach to Stakeholder Management, please get in touch. We'd be happy to give you a demo of the software, or even just have a chat about your Stakeholder Management issues. Strategize how you will prioritize and approach either individual, organisation or group of stakeholders. "Stakeholder Mapping" is a term often used to describe the process of assigning values that shape priorities and strategies for each stakeholder based on their ranking against some set criteria. Sometimes stakeholders are simply assigned a rank against each criteria. Often they are plotted on a matrix to provide a visual depiction of the range of stakeholders in your program. There are a number of standard frameworks used for Stakeholder Mapping. It is a part of Stakeholder Analysis that many organisations do, particularly for their strategic stakeholders. Most people use a High-Medium-Low ranking or a 1-5 rating system for each of these criteria. Stakeholders are then plotted on a grid of Influence/Interest or Influence/Impact. After you have ranked your stakeholders or plotted them on these matrices, you need to consider how this information will influence your engagement plan and strategy. 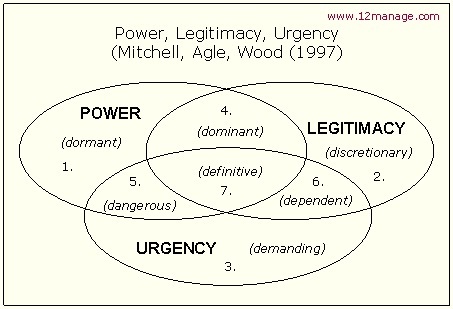 Another popular model for Stakeholder Mapping - the Power/Urgency/ Legitimacy model from Mitchell, Agle and Wood is used to anticipate stakeholders behaviour. Legitimacy – of the relationship and actions with the organization in terms of desirability, properness or appropriateness. Stakeholders that fit into area 1, 2 or 3 are called Latent Stakeholders. With only one of the three characteristics they are considered less critical for success. Stakeholders in areas 4,5 or 6 are called Expectant Stakeholders. These stakeholders often have a direct financial stake or impact from your project. The stakeholders that have all three characteristics in area 7 are called Definitive Stakeholders and would generally take top priority. We're not advocating that you follow any of these models in a prescriptive fashion. For example a "latent" stakeholder could easily derail your project if they get enough traction on social media for example. The power-influence relationships are shifting, particularly with the easy access to social media, the higher community expectations and risk-averse nature of governments when it comes to political damage. Instead we see them as a useful way to understand your stakeholders and ensure that your strategy and engagement plan adequately caters to all stakeholders' needs. Having clear, well documented processes for your Stakeholder Management are getting more important with increasing legislation and concerns around privacy and use of personal data. Making it easy for the public to request a copy of the data you store on them, and providing it in a machine-readable format. Comprehensive - ensure that your stakeholder lists adequately represent the whole range of stakeholders. Your needs assessments and engagement programs are all dependent on you having up-to-date and representative stakeholder lists. Use segmented stakeholder lists to provide a more relevant 'customer experience' for your stakeholders. Getting a shared, up-to-date contact list that can be worked on by multiple people simultaneously is often a big win for an organisation that has been managing their stakeholder lists in multiple spreadsheets. Just knowing that you have access to the 'latest' and most up-to-date list can be a huge time saver. (Be aware of privacy and other legislation around the use of personal information - make sure you are still compliant with the legislation in your country). If you have a sign-up form on your website for example, make sure you collect all the fields that you have decided are important to track. This will save you time, and also give you much richer information on a stakeholder, than just their name and email address. Ofcourse you do need to balance out having an onerously long form to fill out vs making it quick and easy for people to sign up. Does your stakeholder management software make it easy for you to 'clean' up your data? Look for duplicate stakeholder records for example and merge them. Better yet, if your system allows for sophisticated sharing of stakeholders across projects, you should have much cleaner, easier-to-manage stakeholder lists. One way to vastly improve your engagement activities is to group and map your stakeholders to examine key factors including demographics, level of relevance, influence, impact and interest. Through mapping and categorisation, you will be able to gain a good understanding of your stakeholders and will be able to gauge your engagement and ensure you are targeting people who are relevant, influential, impactful or of interest to your project. Establishing a level of interest, influence and/or impact will enable you to interact more efficiently with a particular stakeholder. High: Stakeholder with strong ability to impact your project. Medium: Stakeholder with a significant interest in, but a lower level of power to affect the project. Low: Stakeholder with little ability to affect the project. A well-functioning grievance mechanism provides a transparent, credible, and fair process to all parties. It enhances outcomes and gives people the satisfaction that their complaints have been heard, even if the outcome is less than optimal. A good complaint handling process helps build trust as part of the broader community relations activities and contributes to the overall success of the company’s social performance.